In July 1993, port equipment including 6 transtainers and 2 container cranes were transported from Portland and Los Angeles/Long Beach to Nanjing, China. The transtainers were rolled on over the stern in Portland, OR. The Starporter crane (weighing approx. 650 t) was loaded in Los Angeles, after which the ship shifted to Long Beach for loading of the Peiner crane (weighing approx. 950 t). The cranes were skidded on and off over the side of the transport vessel, using tracks and skid shoes. The skid shoes housed hydraulic jacks for lifting the cranes. 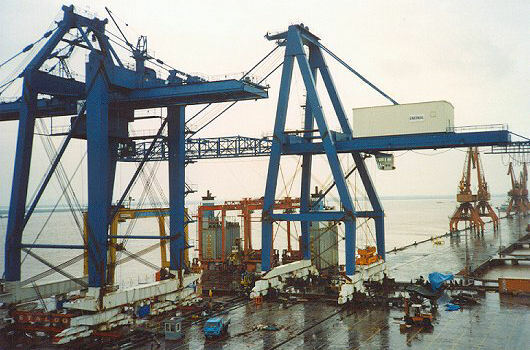 After loading, the cranes were secured to the deck with steel pipes. Argonautics Marine Engineering, Inc. was hired to supervise the loading operations in Los Angeles and Long Beach. Upon arrival in Nanjing, Argonautics Marine Engineering, Inc. also supervised the offloading operation. Supervision of the offloading of all equipment upon arrival in Nanjing, China.